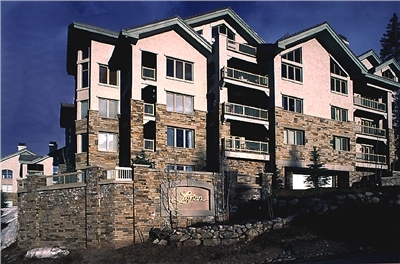 The Lorian complex is located in the Mountain Village just across the street from the Sundance ski run. These units are located near the Intercept gondola which takes visitors into the Mountain Village core. 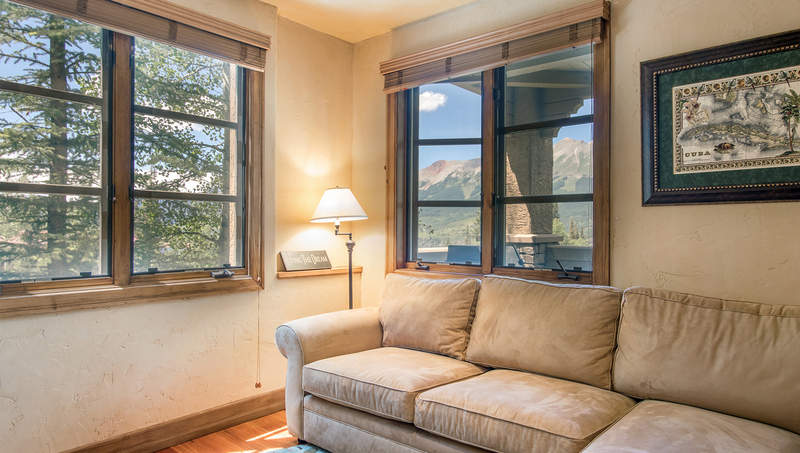 Many of these beautiful units boast great views, fireplaces, and laundry facilities. Complex amenities include a seasonal pool, common hot tub, complex game room, and a parking garage. Ski Side - Lorian 18 is a 3-bed/3.5-bath gem possessing towering views of the Sneffels Range from both the comfortable interior living spaces and from each of the three outdoor decks. 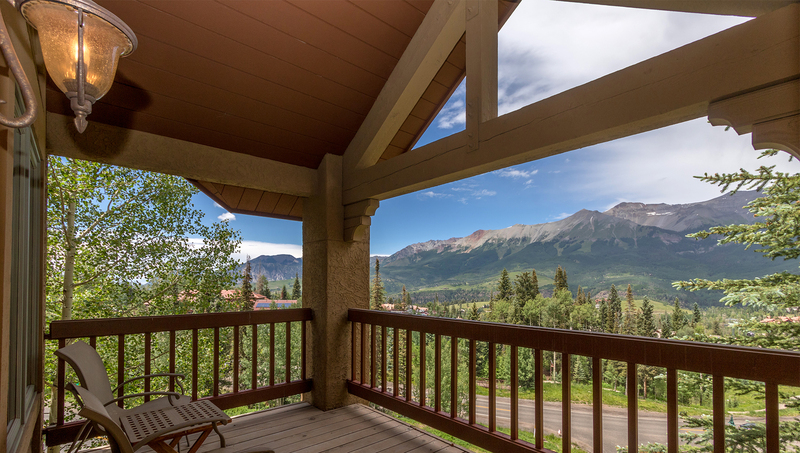 With on-grade ski access and close proximity to the Mountain Village Market and the free Gondola, this property is a terrific choice no matter the time of year. Entering the front door of Lorian 18 brings you into a short hallway and mudroom with space for your shoes and coats. On the left side of the hall is a convenient half bath serving the main living level, and on the right is the stairwell access to the private master suite upstairs and two bedrooms downstairs. The hall opens to the dining room and a classic wooden table with seating for six. 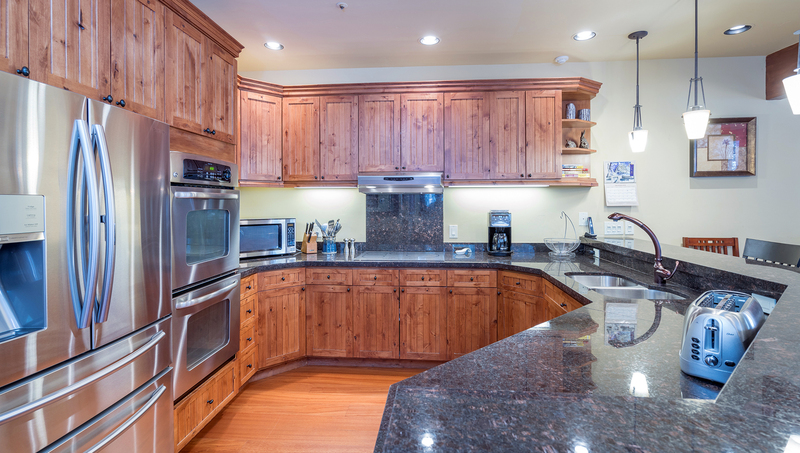 The fully-equipped kitchen adjoins, featuring granite counters, an open design and three stools at the bar. The Great Room is separated from the dining room by a glass-walled fireplace, a central feature that both warms the living spaces and creates a true mountain atmosphere. The Great Room has two distinct sitting areas - a comfortable lounge sofa nearer the fireplace plus a den-like area that features a leather sofa and two leather chairs around a coffee table. A large flat screen TV occupies the space above the fireplace. The first of three decks is accessed from the living room, a large space with unimpeded views of Iron Mountain and the west end of the Sneffels Range. Up one level from the main floor brings you to the Master Suite. Under vaulted ceilings it features a king bed, an in-wall gas fireplace, a flat screen TV and a spacious office. The private master deck enjoys the same views enhanced form one-story higher. The master bathroom features Travertine tiles and is equipped with double sinks, WC, a steam shower and a large jetted tub. 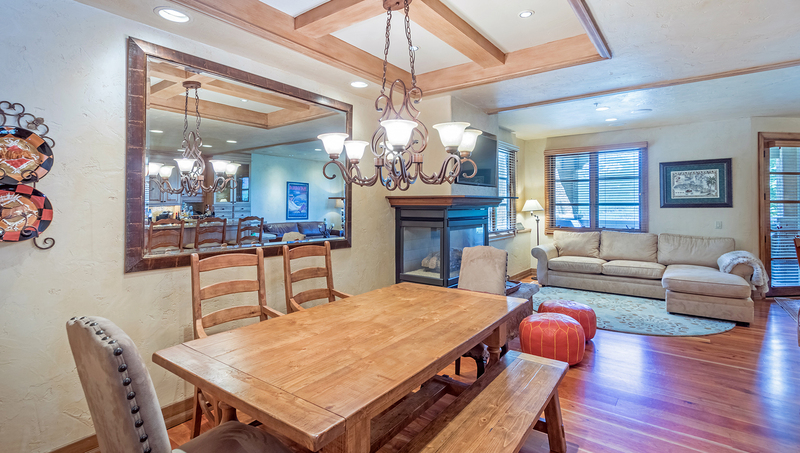 The walk-in closet provides all the storage you will need while holidaying in Telluride. On the bottom floor of the condominium you will find the second bedroom with a king bed. There is an en suite bath with a single sink, WC and shower/tub combo. The third bedroom is also located on this bottom floor. It contains a twin bunk bed and an additional twin trundle bed. The en suite bathroom has a single sink and a shower/tub combo. Both lower bedrooms open to the third deck, a serene alpine setting with an inviting hammock. The private laundry room with washer/dryer is also on this lowest level. Ski Side has great mountain views throughout. You will have full use of an assigned parking spot in the garage, the clubhouse complete with pool table, poker table and ping pong, exercise facilities, and a ski locker located along the walking path to the elevator. The on-grade ski access to the Double Cabin ski run is just across San Joaquin Road. There is also an outdoor heated pool for guest use during the summer season and a common hot tub to enjoy year-round. The Lorian complex is across the main road from the Mountain Village Market and the free Gondola that will take you to the Village Core and the Town of Telluride. The Summit at Lorian is the alpine hideaway close to skiing and hiking trails and the free gondola yet removed from the bustle just enough to ensure a relaxing holiday amid the San Juan Mountains of Southwest Colorado. Bedding: King, Split King, Queen, Queen Sleeper Sofa (loft). Entering this penthouse level condominium brings you into the spacious entry hall with with a coat closet, bench and plenty of room for your coats and shoes. The primary living spaces and two bedrooms are found on this lower of two levels. The design is open, taking advantage of the big views looking west toward the Sneffels Range and the San Miguel Canyon. The kitchen features stainless appliances, granite counters and all the tools and space you will need should you decide to stay in and cook. The bar is fronted by four bar stools that complement the adjoining six-seat dining table. The living room is warmed by a gas fireplace and furnished with inviting furniture set in two separate spaces. There is a flat screen on the wall and a balcony overlooking the Double Cabin ski trail. A convenient half-bath serves these primary living spaces. Two bedrooms and a shared bath are also found on this main floor. Both enjoy good volume, roomy closets and flat screens. The east bedroom has a queen bed while the west has a split king, able to be setup as two twins. The bathroom sits between the two bedrooms and features double vanity sinks, steam shower and jetted tub. Back to the entry hall and up a flight of stairs brings you to the master level loft, fully-furnished as a second living room with large flat screen and a queen sleeper sofa. 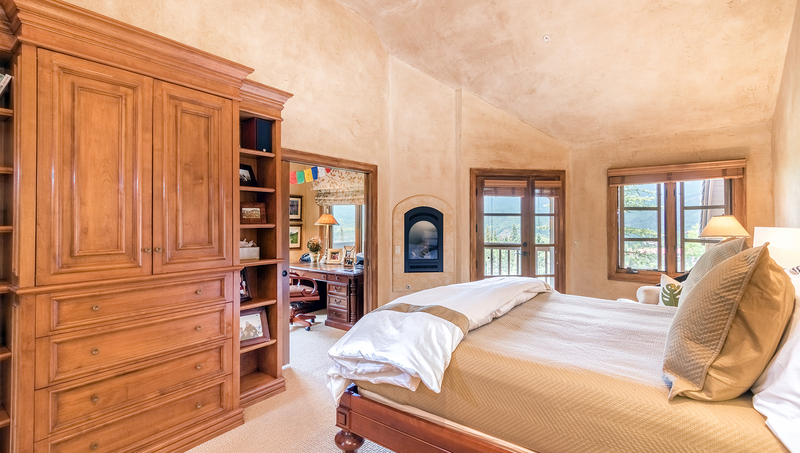 Under vaulted ceilings, the west wall of the master suite is primarily glass, filled with sunset and mountain views. There is a king bed, a walk-in closet, a mounted flat screen and a ceiling fan. The master bath has a jetted soaking tub and a large steam shower, double vanity sinks and abundant counter space. The property has one assigned parking space in the garage. Guests enjoy use of the clubhouse complete with pool table, poker table and ping pong, exercise facilities, and a ski locker one level down. The on-grade ski access to the Double Cabin ski run is just across San Joaquin Road. There is also an outdoor heated pool for guest use during the summer season and a common hot tub to enjoy year-round. The Lorian complex is across the main road from the Mountain Village Market and the free Gondola that will take you to the Village Core and the Town of Telluride. The Summit at Lorian delivers luxury and convenience any time of year. Enjoy all that the Telluride region has to offer by letting your Sea to Ski concierge assist you. Whether grocery shopping or dinner reservations or a memorable excursion, Sea to Ski is here to make your Telluride holiday the best it can be. 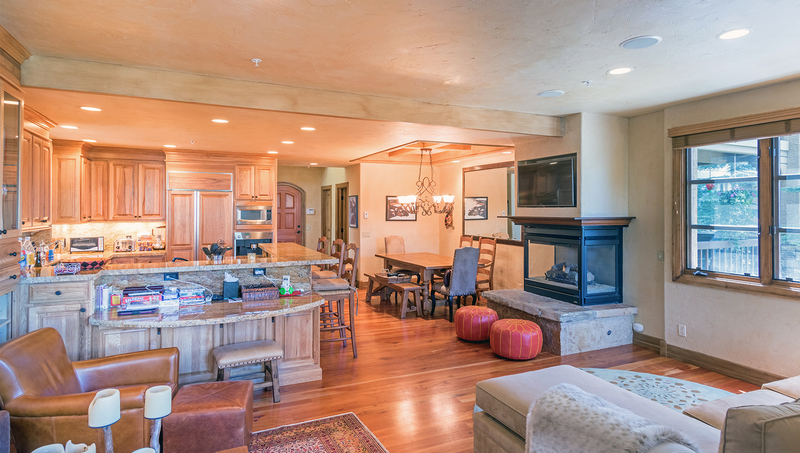 Casa on the Creek is a luxurious, private condominium with easy ski access from a convenient location in the Mountain Village. Bedding: California King, Split King, Split King, Twin Sleeper Sofa, Twin Sleeper Sofa. Entering the front door of Lorian 20 brings you into a short hallway and mudroom with space for your shoes and coats. On the right side of the hall is a half bath, and on the left is the access to the private Master Suite upstairs and two bedrooms downstairs. The hall opens to the main living area and the kitchen. With expansive granite countertops, stainless steel appliances and a plethora of storage, this kitchen will satisfy the most discerning chef. The kitchen has a bar with four stools and the adjoining dining room has seating for eight. Providing warmth and an alpine ambiance, a three-sided gas fireplace is located between the dining area and living room. The living room has two comfortable sofas, a large flat screen TV and a small reading nook with a twin sleeper sofa. The large outdoor balcony is accessed from both dining and living rooms, expanding the living spaces into a serene mountain setting among the towering Fir trees with the sounds of Prospect Creek completing the scene. Up one level from the main floor brings you to the Master Suite. It features a California King bed. There is a cable-equipped TV as well as the entrance to the suite's private outdoor balcony. 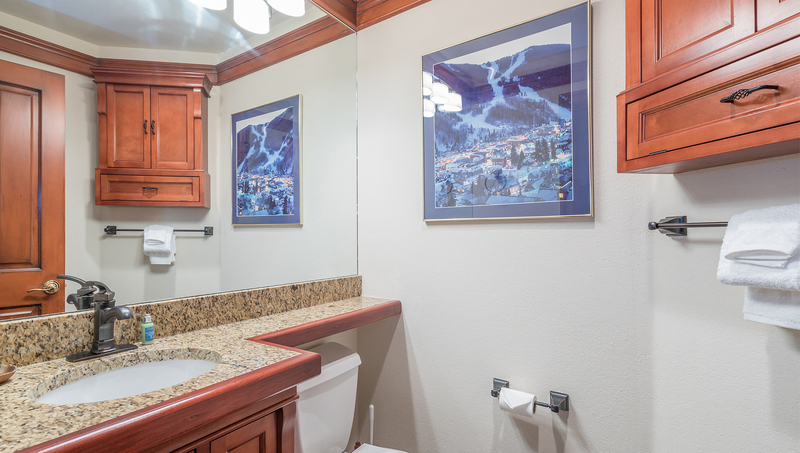 The Master Bathroom is equipped with double sinks, WC, a steam shower and a large jetted tub. The walk-in closet provides all the storage you will need during your Telluride holiday. On the bottom floor of the condominium you will find the second bedroom with a Split King Bed. There is an en suite bath with a single sink, WC and shower/tub combo. The third bedroom is also located on this bottom floor. It also features a Split King bed, a large closet and an en suite bathroom with a double sink, WC and steam shower. Both bedrooms open to the third deck, which provides access to the open space and creek below. The private laundry room with washer/dryer is also on this lowest level, as is a private sun room full of windows to bring the Colorado forest indoors. The room features a twin sleeper sofa and electric fireplace. Casa on the Creek has great mountain views throughout. You will have full use of an assigned parking spot in the garage, the clubhouse complete with pool table, poker table and ping pong, exercise facilities, and a ski locker located along the walking path to the elevator. The on-grade ski access to the Double Cabin ski run is just across San Joaquin Road. There is also an outdoor heated pool for guest use during the summer season and a common hot tub to enjoy year-round. The Lorian complex is across the main road from the Mountain Village Market and the free Gondola that will take you to the Village Core and the Town of Telluride. I’m interested in Lorian #20, Casa on the Creek, for five nights in August, somewhere in the vicinity of Aug 14-19. Is this property available?